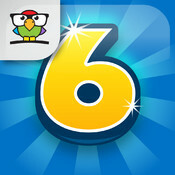 6 Numbers is a math game developed by Brainbow. In each level, you’re given a bunch of numbers and mathematical operators (+ – x ÷) and a target number. What you need to do is arrange the numbers in 2 or more lines so that you’ll arrive at the target number in the end. Below are the answers to the first 100 levels of 6 Numbers. Please scroll down to the bottom to find the links to all other levels. 9=100 8=143 7=162 6=165 5=? If 9 = 100 If 8 = 143 If 7 = 162 If 6 = 165 Then 5 = ?? IF 9 = 100 8 = 143 7 = 162 6 = 165 Then 5 = ? If 9=100 8=143 7=162 6=165 Then 5=? if 9=100 8=143 7=162 6=165 5=? 9=100 8=143 7=163 6=165 5=? 9=100 8=143 7=162 6=165 5=?? 9=100 8=143 7=162 6=163 5=? 7 15 44 150 620 ? 9=100 8=143 7=163 6=165 5=?? ?